There’s something so comforting about curling up on a cold day with a warm drink. That’s something I miss about living in New York City. Not that I don’t appreciate the beautiful hot weather we have in South Florida. I definitely don’t miss trudging around the snow-laden streets of Manhattan in my winter boots. But I do miss the feeling of coming home, taking off said winter boots, and enjoying a comforting drink that warms you up from the inside out. Especially during holiday season when the Christmas tree lights are up and the radio stations are all playing holiday music (yes, I’m a sucker for holiday music). Whether you’re looking for a fun and delicious new beverage to serve to your guests at your holiday party or just a special treat to enjoy by yourself, mü coffeehouse cocktails are the perfect choice. Anyone who knows me knows that I’m a coffee girl. Not only do I enjoy drinking it, I also spend a good amount of time at coffeehouses. So when I heard about mü’s line of coffeehouse inspired cocktails, I knew I had to try them. With names like Creamy Vanilla Latte, Creamy Coco Cappuccino, Creamy Chocolate Chai, and Creamy Espresso Macchiato, these drinks are any coffee-lover’s dream! It’s like reading off the menu at my favorite coffeehouse. Coffee break meets happy hour- it doesn’t get much better than that! I decided to try the Creamy Coco Cappuccino because of course you can’t go wrong with coffee and chocolate. It was deliciously creamy and sweet- it’s no surprise that these products have won several tasting competitions. It also had a bit of a kick- I guess that’ s the 13.9% ALC! It would be perfect poured over ice or even blended with ice like a Frappuccino. But I decided to use it to make a new version of one of my favorite holiday drinks- Mexican hot chocolate. After all, you don't need to have cold weather to enjoy a taste of the holidays. Mexican hot chocolate is a decadent treat- rich, creamy hot chocolate that is infused with exotic spices like cinnamon and a touch of cayenne pepper for heat. Simply heat mü Creamy Coco Cappuccino with milk, cocoa powder and a few flavorings in a saucepan until hot. Then top with a dollop of freshly whipped cream and a final dusting of cinnamon and dive in. I liked the Creamy Coco Cappuccino so much that I couldn’t make just one recipe- I ended up making two. The second dish I made was an affogato, an Italian dessert coffee-based dessert in which hot espresso is poured over ice cream or gelato. I stirred some of the Creamy Coco Cappuccino into the espresso before pouring it over vanilla ice cream and garnished it with fresh dark chocolate shavings. As the hot coffee mixture hits the cold ice cream, it starts to melt- a true feast for the senses. It’s the perfect dessert to serve alongside the mü Mexican hot chocolates whether you’re entertaining guests or indulging by yourself. Mü coffeehouse cocktails are available at Publix and other retailers. Keep an eye out for the $2 instant coupon hanging on the bottles. In addition to enjoying these drinks yourself, they also make great holiday gifts. 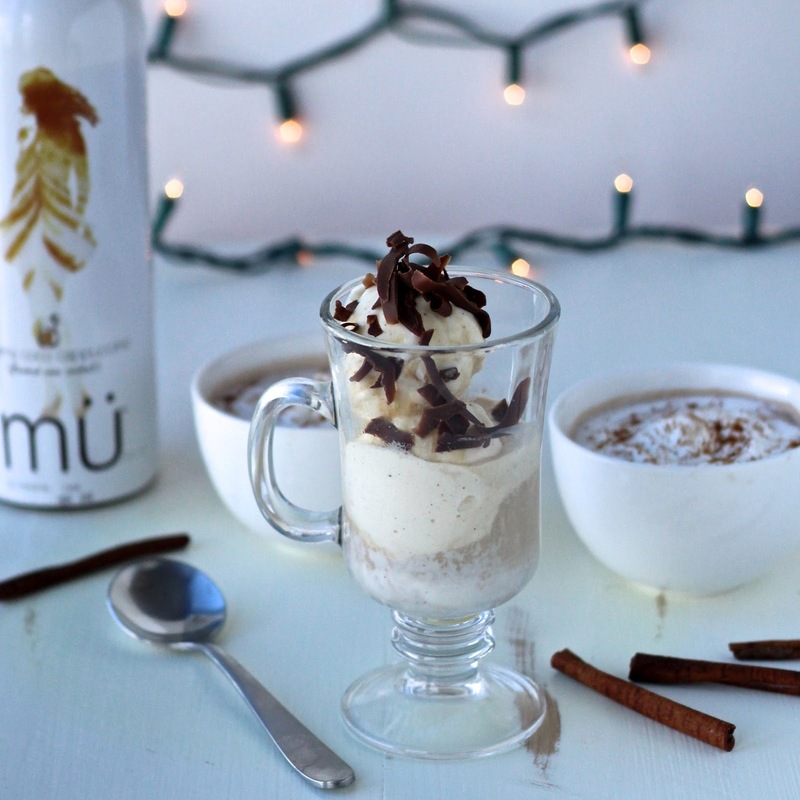 Check out mü’s website to learn more about their coffeehouse creations and to get inspired. What are your favorite drinks or dishes to enjoy during the holidays? Coffee break meets happy hour- it doesn’t get much better than that! Heat the all of the ingredients (except whipped cream) in a saucepan over medium heat until the sugar is dissolved and the mixture is hot. Pour into two cappuccino glasses or mugs and garnish with freshly whipped cream and cinnamon, if desired. Serve hot. Stir 2 tablespoons mü Creamy Coco Cappuccino into each shot of espresso. Place the ice cream into two cappuccino glasses or ice cream bowls, and pour the espresso mixture on top. Garnish with chocolate shavings and serve immediately. omg i am salivating Sonali! These recipes look amazing. I need to find this mu Creamy Coco Cappuccino! Thanks Jessica! You definitely need to find it, it's really yummy! Affogato is one of my all-time favorite desserts and yours looks absolutely perfect! Beautiful, Sonali! Wow, thanks so much Marissa! !